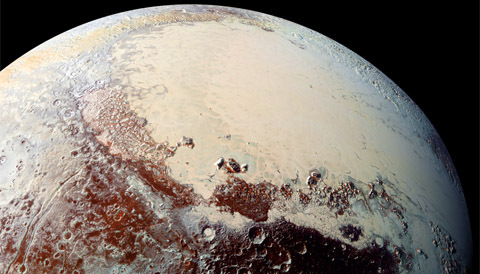 A big, nitrogen-ice-filled basin has apparently caused Pluto's entire crust to shift over time. It's been a couple of decades since Hubble Space Telescope images revealed a persistent bright spot on Pluto that's situated on the hemisphere facing away from the big moon Charon. Last year's flyby of Pluto by New Horizons revealed this intensely white spot, now informally called Sputnik Planitia, to be the western half of a larger, heart-shaped brightening nicknamed Tombaugh Regio. New Horizons confirmed that Pluto's surface is rich in nitrogen, carbon monoxide and methane ices. These compounds appear to be concentrated in this bright, craterless expanse, informally called Sputnik Planitia, that is probably the site of an enormous, ancient impact basin. About 1,000 km (600 miles across), Sputnik Planitia astounded planetary scientists because its surface is crater free (thus very young), rimmed by tall water-ice mountain ranges, and exhibits glacier-like flows that are on the move. Without question, it's Pluto's most dominant geologic feature. It's probably an ancient impact basin that, over time, has been partly filled by a thick layer of frozen nitrogen, methane, and carbon monoxide. Now two analyses conclude that Sputnik Planitia lies almost directly opposite Charon not by accident — statistically, there's only a 5% chance that it formed where it is now, so close to the exact anti-Charon location — but instead because it literally dragged the crust of Pluto around to the current arrangement. Geophysicists refer to this crustal shifting as true polar wander. It's the tendency of spinning objects to reorient themselves so that locations with mass excesses end up on the equator and mass deficiencies at the poles. The pattern of fractures and other tectonic features on Pluto (top) is matched well by a computer model that includes the effects of global expansion (from a freezing ice shell), mass loading, and true polar wander. In November 17th's Nature, four geophysicists led by James Keane (University of Arizona) make the case that the big basin initially existed much farther north, near latitude 60°, and gradually migrated equatorward. "Sputnik Planitia could not have formed in any random location," the team writes. "The initial positions are limited to regions of a single quadrant of the northern, anti-Charon side of Pluto." 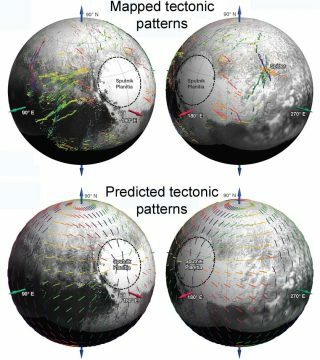 They modeled how Pluto's surface would have become stressed and fractured during this gradual shift, and by the gradual freezing of a global subsurface ocean early in Pluto's history, and these fractures match the ones found on Pluto very well. "It's like freezing ice cubes," Keane explains in a University of Arizona press release. "As the water turns to ice, it expands. On a planetary scale, this process breaks the surface around the planet and creates the faults we see today." However, Sputnik Planitia, currently centered at 176° east, 24° north, is a big depression — so why isn't it parked at Pluto's north pole? One clue comes all the frozen nitrogen inside the basin, which has piled up to form a layer at least several kilometers thick. Nitrogen ice is denser than water ice (1.027 g/cm3 vs. 0.934 g/cm3). So it represents a huge slab of extra mass. 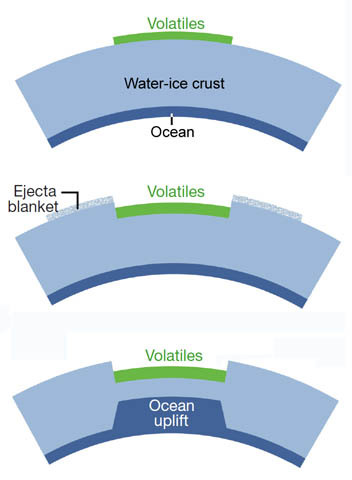 But an ice slab alone isn't enough, argues a team of New Horizons scientists led by Francis Nimmo (University of California). In an accompanying Nature article, they calculate that the nitrogen ice would have to be at least 40 km (25 miles) deep to trigger the basin's equator-ward shift. That's implausibly thick, so Nimmo's team argues that more excess mass comes from a broad, near-surface bulge in the subsurface ocean that underlies the basin. "It's a big, elliptical hole in the ground, so the extra weight must be hiding somewhere beneath the surface," Nimmo notes in a UCSC press release. "An ocean is a natural way to get that." In order for Sputnik Planitia to have shifted toward Pluto's equator, it must have had excess mass relative to the crust around it. Three possible sources of that buildup are a thick layer of nitrogen ice (green), impact debris around its perimeter, or a bulge of liquid protruding upward from below. Nimmo's team argues that the Sputnik Planitia impact probably created a hole in Pluto's ice crust about 7 km (4 miles) deep. This crustal thinning allowed the underlying ocean (likely high-pressure mix of water and some "antifreeze," such as ammonia) to well upward to create a huge lens of near-surface fluid. And because liquid water is denser than its ice, the broad bulge created an initial mass excess. (It's the same kind of mass concentration, ormascon, under many of the Moon's maria.) Then nitrogen ice accumulated on top, adding even more extra mass to Sputnik Planitia's imbalance. "Each time Pluto goes around the Sun, a bit of nitrogen accumulates in the heart," Keane says. "This idea of a whole planet being dragged around by the cycling of volatiles is not something many people had really thought about before."